Nelson Mandela (1918-2013) is a myth. He has become greater than his own life. Every generation gets a few people like him whose contributions are seen as outsize. Gandhi suffered that same fate. It is as if Gandhi delivered India from the British almost single-handedly, or that Mandela did the same thing for South Africa, saving it from the clutches of apartheid. Such people are raised to the level of deities – incarnations of some higher power sent down to lift the yoke of suffering from ordinary people. It implies that everyday people are not capable of making their own history. Of course, people like Gandhi and Mandela played an enormous role in history, not as supermen but as galvanic figures whose inspiration drove thousands of people into dangerous missions against the normalcy of life toward a hopeful future. Suffering is aplenty, but suffering alone does not give people courage to stand up against the reasons for that suffering. It takes a myth – either a person or a political vehicle (a party) or indeed the horizon of a new ideology – to enable people to see the time of the present as insufficient and the time of the future as possible. That’s the role that Mandela played, sitting vigil in prison for twenty-seven years as ordinary South Africans fought the apartheid regime on the streets outside. No-one can take that achievement of being the myth of the anti-apartheid regime away from Nelson Mandela. The most scandalous appropriation of Mandela comes from the Right. There is something unseemly about this seizure given that its main protagonists – the conservatives of Britain and their settler colonial allies (the conservatives of the US, Canada and Australia) – continued to ally with apartheid South Africa and consider Nelson Mandela as a terrorist (the United States had him on the terror list till 2008). Their attempt to claim him was crowned by the presence of George W. Bush and David Cameron at Mandela’s memorial service in South Africa. But this attempt is like that of a snake trying to claim a shed skin that is not its own, encouraged to slither into it and preen for a past that is at great remove from the truth. Along the grain of the Right’s attempt to appropriate Mandela comes that of liberalism, which sought as well to banish the crimes of apartheid during its heyday with mealy-mouthed claims for gradualism – reform of such a structure of apartheid South Africa being impossible, such talk meant the defence of the status quo. A good example of the myopia of liberalism is US President Jimmy Carter’s State Department Declaration from October 1977, more than a year after the June 1976 Soweto Uprising, which could only call upon South Africa to acknowledge procedural rights – end unlawful detention, for instance, -- but not to begin a process of dialogue to unravel apartheid. Even US liberalism felt the need to acknowledge, against the prison house of racial discrimination, the white minority view taken by John Vorster, South Africa’s Prime Minister, that his country would either have apartheid or it would commit racial suicide. To have US President Barack Obama, today’s liberal standard-bearer, at Mandela’s memorial service lecturing the world about the problems with procedural rights as his government conducts extra-judicial drone strikes and continues to hold prisoners without habeas corpus provisions shows you the nadir of liberalism. Less offensive than the appropriation by conservatives and by liberals is the no less startling rush to criticise Mandela from the redoubts of an unreflective far reach of the left. The more vulgar attempt comes from the British-Australian journalist John Pilger, whose essay for the New Statesman appeared in July and then was recirculated after Mandela’s death. The essay was both obvious and offensive. It was obvious because it is not easy to see that little of the promise of the anti-apartheid movement has come to pass – yes, formal racial discrimination ended, but yes, economic apartheid largely along racial lines continued. This is a point that was made as early as 1996 by the South African Communist Party (SACP) when in one of its challenges to its tripartite alliance with the African National Congress (ANC) and the Congress of South African Trade Unions (COSATU) it called the policy framework of the Mandela government The Class Project. Rather than tease out the complications of the decade of the 1990s, Pilger resorts to some cheap shots, ending maliciously, with Mandela described by Pilger as getting into a “silver Mercedes.” Does this imply that Mandela had sold out because he was enjoying the fruits of power? Was this a silver coloured Mercedes, or a silver-plated one? Was this owned by the new South African government or had Mandela pilfered it? What did Pilger expect him to get into? What car model is acceptable for Mandela? Was Mandela expected to walk the long road to freedom? The article ends with this distasteful innuendo after it seems to hold Mandela responsible for the current state of South Africa. Was he pushed or did he jump? There is little question that the condition in South Africa today is miserable for the majority of the population. The statistics of disparity are easy to find and it is not hard to identify as responsible the kind of policies chosen by the government led by the ANC-SACP-COSATU for almost twenty years. Since he took over leadership of the Centre for Civil Society at the University of KwaZulu-Natal in 2004, Patrick Bond has helped incubate a serious and empirical critique of ANC policies. Bond came to this post after working in the South African government for the previous decade on its Reconstruction and Development project. Three of Bond’s books are serious engagements with the failures of South African development: Elite Transition: From Apartheid to Neoliberalism in South Africa (2000), Against Global Apartheid: South Africa meets the World Bank, IMF and International Finance (2001), and Talk Left, Walk Right: South Africa’s Frustrated Global Reforms (2004). These are fine-grained analyses of the failure of the ANC government to break away from the neo-liberal consensus of the 1990s and 2000s. With Mandela’s passing, Bond wrote a strong essay in the Australian journal Links entitled “Nelson Mandela’s years in power: Was he pushed or did he jump? (5 December). Unlike Pilger, Bond is not dismissive of Mandela. He appreciates his immense achievements, but does ask the fundamental question – was it under Mandela’s watch, as anti-apartheid veteran and ANC government official Ronnie Kasrils suggested, that the inexorable drift toward corporate power took place? If it was under his watch, did Mandela guide it willingly or grudging. That’s the meaning of the question, was Mandela pushed or did he jump. There is no easy method to evaluate this question. To do so requires more than an evaluation of the intentions of Mandela or his ideological views. A crucial factor is to study the context. This is what Bond does not spend too much time on. Why should he? He is immersed in the struggles over South Africa’s present, and, as his books demonstrate, he is in command of the details of the debates inside South Africa. There is no need for Bond to explore the context of this or that policy given that his audience inside South Africa is aware of the context neurologically. Nonetheless, in his essay Bond does provide a generous exploration of the context – introducing us, as he does in his 2001 book, to the process by which Pretoria joined the General Agreement on Trade and Tariffs in 1994 “as a result of pressure” from the Clinton White House and to the process by which the Rand – South Africa’s currency – was whipped into shape by the Mexican currency fiasco in 1995. The nature of the GATT entry meant, Bond notes, the deindustrialization of South Africa, and the financial liberalization narrowed the space for the Reserve Bank to engage with simple tools such as capital controls. The West and financial markets constrained the policy space for South Africa. That kind of context is essential for any evaluation of Mandela’s decade as head of government – from 1994 to 1999. 1) Demise of the Soviet Union and weakening of the Socialist bloc. Stalwart in its solidarity with the South African national liberation struggle was the socialist bloc, namely the USSR but most importantly the Cubans. It was the Cubans who supported the Angolan national liberation movement, and it was there military presence at Cuito Cuanavale in 1987-88 that weakened the South African military by its successful intervention. The Angolan military defeat of South Africa dampened its confidence. One of Mandela’s early trips after his release was to Cuba, where he thanked the island nation for its support. In Havana, Mandela said in July 1991, “We admire the sacrifices of the Cuban people in maintaining their independence and sovereignty in the face of a vicious, imperialist-orchestrated campaign. We too want to control our destiny.” It is likely, although we have no good evidence for this, that Mandela would have been made aware already of the austerity-driven Special Period which opened up as a result of the end to the special economic links with the USSR and Eastern Europe and as a result of the new stranglehold placed by the US government. This was the worst period in Cuba’s history, and it would have been impossible for Mandela not to have been told about it (one of the remarkable things about Fidel Castro was his forthrightness about the economic difficulties of his resolute island nation). It was not clear in 1991 that the Cuban independence and sovereignty would outlast the collapse of the USSR. 2) Demise of Third World Project. By the end of the 1980s, the Third World Project – the raft of polices of the Non-Aligned Movement (NAM) bloc – had collapsed under the weight of the debt crisis (for an introduction, see my The Darker Nations, available from LeftWord Books). This induced debt crisis wiped out the policy alternatives – such as nationalization and import-substitution – that had provided a way for the new post-colonial nations to develop their national economies. No longer were such mechanisms possible as the IMF controlled the spigot of commercial and multilateral credit and would only release the tap if the indebted countries agreed to accede to a reform agenda that opened the nations to the “market economy,” viz. to international finance capital and to multi-national corporations. Mandela’s first trip out of Africa in the winter of 1990 was to India – where he hastened to West Bengal to a mass rally organized by the Left Front government. In Calcutta, Mandela said he was interested in learning what the Left Front government had been able to do despite the constraints of the Indian federal structure. Having learned about the twin successes of agricultural development (land reforms and operation barga) and grassroots democracy (panchayati raj), Mandela had to absorb the reality that deindustrialization was not an easy problem to undo. Three years later the Left Front government would create a new Industrialization policy that was gripped by the suffocating policy space of the era of globalization. India’s central government would go to the IMF in the matter of a few months and inaugurate its own long surrender to neo-liberalism. Mandela was not unaware of the problem. When he came to India he was asked by the media and by politicians how he planned to move his party from struggle to governance. “The query came from concern, not cynicism,” writes Gopalkrishna Gandhi who was then in the President’s office. “Mandela did not give elaborate answers but his demeanour showed he was in some tension.” How could he not be? Many of his peers, such as Tanzania’s Julius Nyerere, had been as confounded by the new reality. Nyerere led the South Commission, whose report from August 1990 found it hard to break away from a discomforting predicament – history had been unkind to Communism and to the Third World Project (for more on the role of the South Commission, please see my The Poorer Nations: A Possible History of the Global South, LeftWord, 2013).. In 1990, all that seemed to remain was Americanism – free markets and an anaemic liberal democracy. This was the basis of the new period of US primacy. 3) Ascendency of US Primacy. One of the developments that I detail in The Poorer Nations is the way US primacy enabled the reconstruction of the IMF and the World Bank to suit the interests of finance capital and multi-national corporations. Their actual agendas were no longer suited to even a nominal commitment to development – the new agenda was to use their leverage to pry open post-colonial states for the exploitation by banks and firms that flourished under the umbrella of US primacy. This is what Bond writes about when he mentions South Africa’s December 1993 loan from the IMF “ostensibly for drought relief, although the searing drought had ended 18 months earlier.” The seamy side of the deal was the secret condition (leaked in March 1994) that showed that the quid pro quo was the capture of South African economic policy making by the structural adjustment framework. As well, Bond points to the way IMF managing director Michel Camdessus virtually forced (“intense pressure” is the phrase Bond uses) the ANC to reappoint the apartheid era finance minister and central bank governor. This set in motion the surrender of the new South Africa before neo-liberal power blocs and their preferred policy options (finally to appear as the Growth, Employment and Redistribution – GEAR – agenda, which the SACP called the 1996 Class Project). In this context, Mandela’s government had to operate. He did not take power in 1962, when he began his prison term, nor in 2000, when the Latin American breakthrough provided some openings for an alternative. His government took power in the 1990s, the high point of US primacy and of neo-liberal policy making. Why Didn’t Mandela Become the Chavez of Africa? When Yasser Arafat of the Palestinian Liberation Organisation (PLO) signed the Oslo Accords in 1993, Edward Said dubbed it the Palestinian Versailles. It was a surrender of the Palestinian national dream rather than its validation. Why did Arafat sign this document? The context is once more important – the USSR, one of Arafat’s backers, had vanished; the Third World Project had not only withered, but Arafat’s decision to side with the Iraqi regime of Saddam Hussein in the first Gulf War undermined him and showed that his fealty to old national liberation nostrums was no longer shared by the NAM bloc. But most importantly, Arafat was said to have lost touch with the Palestinian masses, having been in exile in Tunisia since the ejection by the Israelis of the PLO from Beirut in 1983. In other words, Arafat had been out of touch with the Palestinian refugee camps and its occupied lands for ten years. But this is nothing. 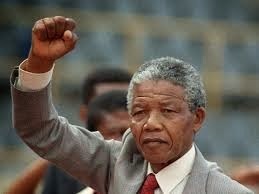 Nelson Mandela spent twenty-seven years in prison. He was not directly in touch with the masses of the South African poor whose livelihood and political aspirations had crumbled during those decades despite their resolute fight-back. The exiles in Maputo and London had links to the struggles in South Africa, but they too had a highly mediated relationship with the townships and the rural areas. A few leaders had maintained networks that were electric by 1990, first among equals being Chris Hani, one of the brightest lights of the SACP. When Hani was assassinated by the recesses of the apartheid state, it was a blow not only to the ANC and the SACP but to the potential for a popular hold on the new government. When Mandela spoke at Hani’s funeral in Soweto in 1993, he pledged that the “highest priority” for the new government “will be the issues that were closest to the heart of Chris Hani: the reconstruction of South Africa so as to ensure that apartheid is not reformed, but uprooted in its entirely…..We want to build a nation free from hunger, disease and poverty, free from ignorance, homelessness and humiliation, a country in which there is peace, security and jobs.” If Hani had been alive, the SACP would perhaps have had the leadership to build an alternative Class Project, a proletarian project, linked to the organized masses of the townships and the rural areas, whose pressure would try to counter that of US primacy. But it was not to be. Hani had been killed, as were other activists whose tentacular reach into the lives of everyday people would have produced a different path for South Africa. The killing of Hani in 1993 cut away the potential for that counter bloc in an adverse international environment. This is not to say that Hani was the loadstone and the SACP without him was empty; it is to say that the assassination of Hani dampened the ability of that alternative pole to grow not just ideologically but in terms of the production of a mass movement around that alternative ideology. The assassination of Hani defined the emergent ANC – the absence of genuine leadership for the townships lead to the classic politics of clientalism, depriving the zones of endemic poverty with an artery to the higher reaches of power. With people like Hani at his side, and there are more than simply Chris Hani, Mandela might have been able to produce some kind of resistance to pressure from the old apartheid state, its old allies, the emergent neo-liberal power bloc and accommodative sections within the ANC. It was a formidable challenge for anyone in that context. Through the fortitude of Mandela, who refused to make a deal with the apartheid regime to secure his release from prison, the anti-apartheid movement grew. It is impossible to assess Mandela without his role in that movement as its centre. If we only had Mandela’s years in power to judge his legacy, the myth would be tarnished. But even those years need to be set in their larger context. Do we judge him for the adverse pressures that he was not capable of overcoming? Do we make a precise assessment of the kind of pressures he had to deal with? He could certainly have refused to do the deal with the IMF and to go back to his people to deepen the struggle from the national question to the social question. Why that did not happen says as much about the 1990s as it does about the exhaustion of the ANC – with leaders eager for the opportunity to real regardless of the limitations. Mandela is not to be held responsible for those limitations although he cannot be fully absolved from them. At the end of Mandela’s years in power, in 1998, Hugo Chavez rode the Bolivarian movement to victory in Venezuela. He opened up a new route – the South from Below. South Africa had by then moved in a different direction , a more accommodative policy to international finance and firms, for reasons that include of course that it had less control over its natural resources than the Venezuelans. A few years after Mandela had left office, in 2003, South Africa would seek to move away from US primacy through another route – the South from Above, the India-Brazil-South Africa (IBSA) bloc that would later become the BRICS bloc. Limited by their concessions, India, Brazil and South Africa exemplify states with major disadvantages vis-à-vis the North-South divide that are at the same time aware that they must make policy space for redistributive or at least welfare programmes for their poor. This is where South Africa is today. It is not Venezuela – with its independence intact, and yet it is also not Colombia – with its independence unclear. The US military overreach and its financial troubles have opened space for both the South from Above and Below to take their opportunities where they can. Where South Africa will go is hard to say precisely. But one thing is clear: it is better for having had Nelson Mandela’s life as one brick in its edifice.